Make the end of your spa visit a little less sad - book a follow-up appointment. Request an oceanfront table and time it just right for catching the glorious sunset. The sunny, stylish fitness center inspires even the not-so-cardio-inclined. After winning game, set, match - even your kid-opponents will have to concede you still hold the family-champ title. Take in sweeping views from the infinity-pool, best enjoyed tropical cocktail in hand. One of Puerto Vallarta's few white sand beaches, Garz Blanca has a new cove calm enough for floating on a raft. From shelling and sand castle contests to snorkel lessons, kids' activities abound. Gourmet snack bar Aquazul delights with 360-degree views of the infinity pool and white sand beach. Talk about effortless, you literally don’t even have to unpack your things (unless for some crazy reason you want to) – the personal butler is just a call away at Garza Blanca Luxury Residences All Inclusive. And the perks just keep coming. A welcome bottle of Moët & Chandon and tropical fruit basket await you inside your stunning two- or three-bedroom residence, plus luxe touches like marble floors, artisan aromatherapy soaps and a premium honor bar. Spend lazy afternoons swaying in the oversized hammock or soaking in the jetted tub on your private wraparound terrace, while the Executive Chef prepares a gourmet dinner in your suite. Or dine by tiki torchlight at the oceanfront restaurant. It’s impossible to go wrong either way. Head out to the protected sea wall area right off the beautiful beach for action shots of the kids taking snorkel lessons, before sneaking off for an open-air spa experience on the jungle riverside. Guided hikes, photography classes and even tequila tastings are all fair game – see what strikes your fancy. When it’s finally time to get your sun-kissed crew packed and headed homeward, give the butler a heads up, and consider your luggage packed and ready to roll. Guests must contact this hotel in advance to reserve a crib. Please contact the office using the information on the reservation confirmation received after booking. 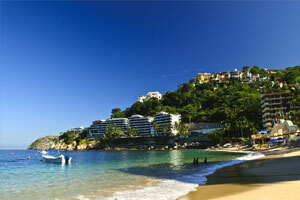 All-inclusive room rates at Garza Blanca Residences All Inclusive are available. These rates are higher because they include onsite food and beverages in the room rate (some restrictions may apply). In 1963, while filming "The Night of the Iguana", Richard Burton began an affair with Elizabeth Taylor that caused quite a scandal and put Mismaloya on the map.